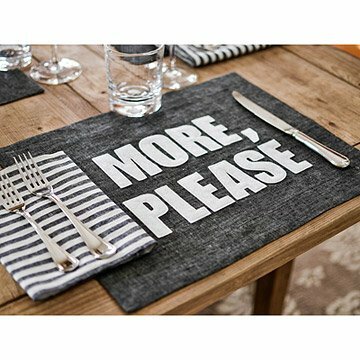 Sit down to delicious style with these handmade placemats. Bring your appetite to the table with these bold placemats by Alexandra Ferguson. Hand cut from a roll of linen, each placemat is finished with bold recycled felt letters. The result is a quirky, modern table spread that looks great with a spray of fresh wildflowers and your favorite brunch. Handmade in Brooklyn, New York. Alexandra’s handmade holiday gift project the winter of 2008 was felt appliqued pillows with material made from recycled plastic bottles. They were a blast to make, and pillow recipients were delighted. Not one to ignore a passionate ‘call to action,’ Alexandra opened her business online in January 2009. With a background in fashion, managing sample rooms for some of New York’s top designers, she had the experience and know-how to take a design from concept to production-ready on the showroom floor. It was time to put her unstoppable work ethic behind her own name. Read a Q&A with Alexandra. Machine wash in cold water on delicate cycle. Line dry and iron on reverse side only. Very cute item, but it is not explicit anywhere in the description that each order includes only one placemat. I mistakenly assumed that two cam in the order (based on the price and it seemed logical). Should state somewhere clearly that only one mat per order. I ordered one of each of the placemats (4 different sayings) and they look so cute on my table.